The Health Innovation Lab is all about collaboration and sharing. We are eager to share information on our field, furthering knowledge and participation. A Gentle Reminder: Primary Care Networks need robust General Practice. How do Practices know how they are doing? Does Clinical Leadership Make a Difference and how do you Develop Clinical Leaders? Primary Care & Scale. Who should we be collaborating with? Sustainability and Transformation Plans. How serious are the proposals? A critical review. In late 2016, 44 geographical areas of England published Sustainability and Transformation Plans (STPs) setting out how health and care will be delivered within their local areas by 2021, to achieve the aims of the Five Year Forward View, to restore and maintain financial balance, and to deliver core access and quality standards for patients. The report is not a commentary on whether there should be STPs but on how they are set up to deliver the level, pace and scale of change required. This report critically reviews each of the 44 STPs in terms of how they stand as serious, coherent and achievable plans. Each was subject to the levels of rigorous appraisal you would expect for a set of NHS planning documents. The researchers were looking for clear expert evidence, how the plans matched population needs, the resources required, the key assumptions in the overall approach, and how local accountability operates across the footprint. Overall the report finds that the STPs are not ready for implementation, with the plans lacking a secure grounding in the current situation, and a robust evidence base to the changes proposed. Significant developments in the relationship between the NHS and Local Government are required and this will take time. The emphasis on reducing acute beds and A&E attendance will require local consultation. Legislative change is also required to free health and care from the constraints of the market to provide integrated quality care for local populations. Finally there is a significant funding shortfall, and a need for clear and robust workforce plans. Read the full report (PDF File 403 KB). This joint position paper between the National Institute for Health Research and LSBU summarises the results of an inquiry workshop with research, clinical and managerial leaders in June 2016. The inquiry focused on how to create a culture of innovation and research in complex systems. For the purposes of this paper, ‘systems’ relate to health and social care systems organised around populations and places. For these systems it is not clear who leads the system, or how they differ in terms of capacity and culture, or how they address the issues of generating an innovation and research culture. Innovation is a situated practice, balancing individual and collective capacities, best realised through network and collaborative relationships. There are significant challenges with moving from local innovation, where there is more tacit knowledge, to systems-wide innovation. We considered the role of disruptive and incremental innovation in systems, and the underlying cultures that create readiness at policy, system and team levels. Read the full paper (PDF File 139 KB). This longitudinal study demonstrates that overall there is much evidence that the Darzi programme has practically and intuitively shown Fellows how to think first and then act differently for alternative outcomes. Fellows are much more proactive than reactive because of the programme. Many responses carried a central message of empowered, enlightened and highly skilled individuals who are actively and uniquely challenging the status quo. Thus, there is clear evidence that the Darzi programme has created a plethora of systems thinkers and doers, with a greater understanding of how to use data to bring about system change. A picture emerged of often bold individuals with a determination to actively instigate change across London and beyond. There is evidence that many Fellows are emerging as leaders, acting as catalysts for sustainable change in the healthcare environment. By any reasonable measurement, the Darzi programme continues to be successful with learning and behavioural change sustained after the Fellowship year. Read the Longitudinal Study (PDF File 1,047 KB). Can volunteering help create better health and care? What volunteer / lay roles are effective in health and care? What do we know about the effective recruitment, management and deployment of volunteers (in any setting)? What evidence is there about the impact of volunteers in health and social care, within England health and social care organisations, and from voluntary sector initiatives working into health and social care? Read the full report (PDF File 738 KB). Prof. Malby discusses the context for networks in health in the UK. Watch Prof. Malby talk on managing inequality through coproduction. The Lab maintains a Pinterest board, collecting interesting and relevant posts. You can also explore our Pinterest board on Leading Networks. 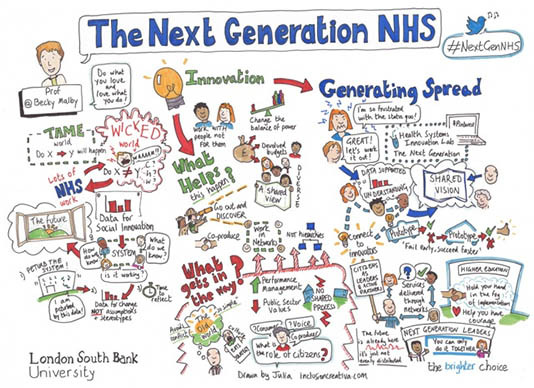 Watch Prof. Becky Malby's inaugural lecture, The Next Generation NHS.